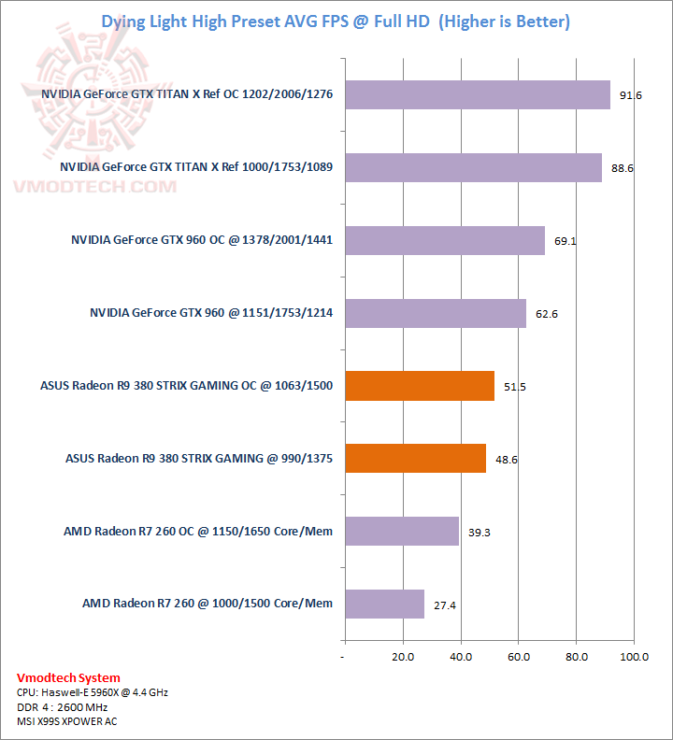 The first review of the ASUS Radeon R9 380 STRIX Gaming graphics card has been posted by VModtech. 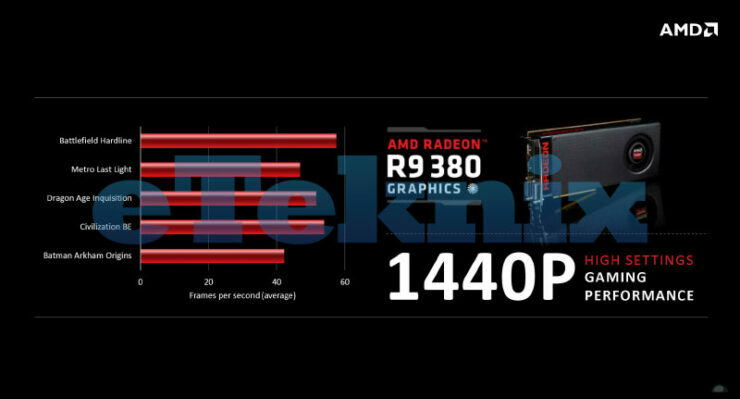 The card which was just announced with the Radeon 300 series product family comes at a price of $199 US and utilizes the Antigua GPU core architecture which is a new name for the Tonga GPU core we saw on the Radeon R9 285 graphics card. 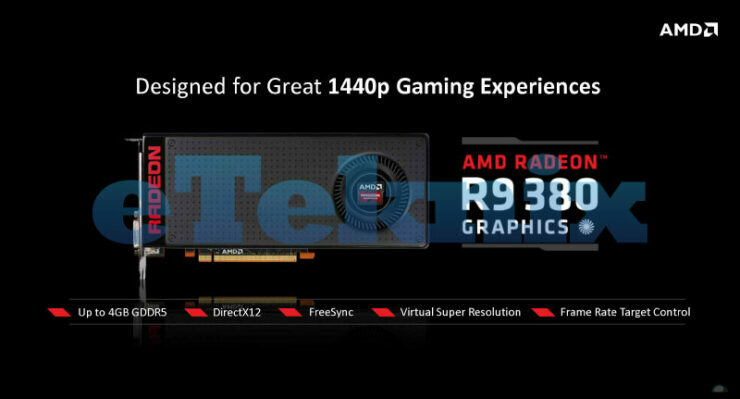 Let’s talk about the card first, the AMD Radeon R9 380 is based off the same GPU core we saw on the Radeon R9 285. 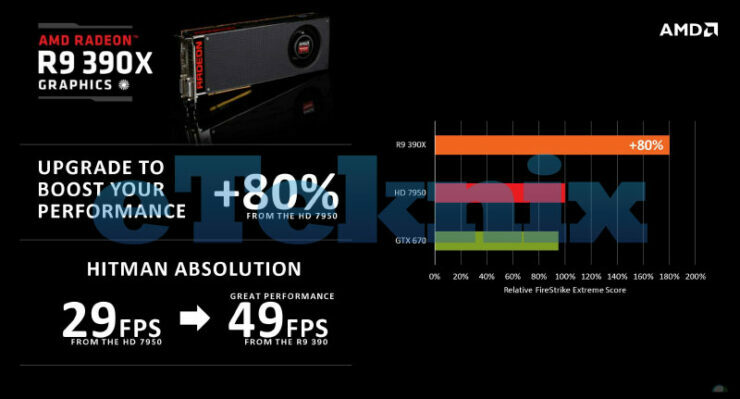 The Antigua GPU (Tonga Pro) comes with 1792 stream processors that are packed inside 28 Compute units and also has 112 texture mapping units and 32 raster operation units. 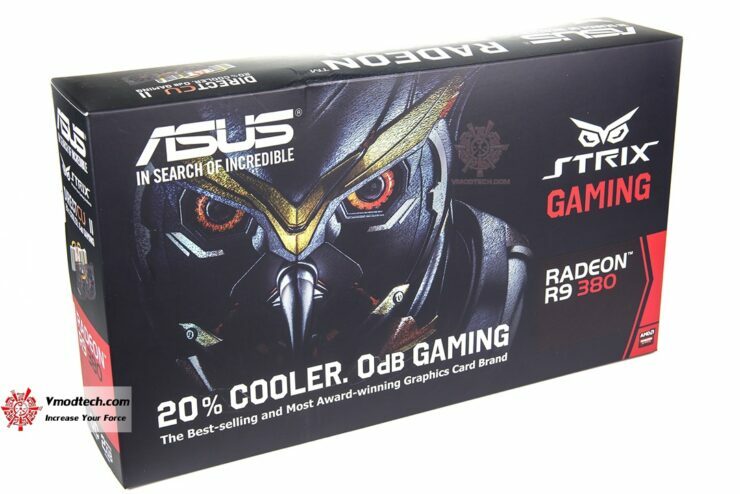 The card is spec’d to be clocked at 970 MHz but the ASUS card comes factory overclocked at 990 MHz with further room available for overclock. 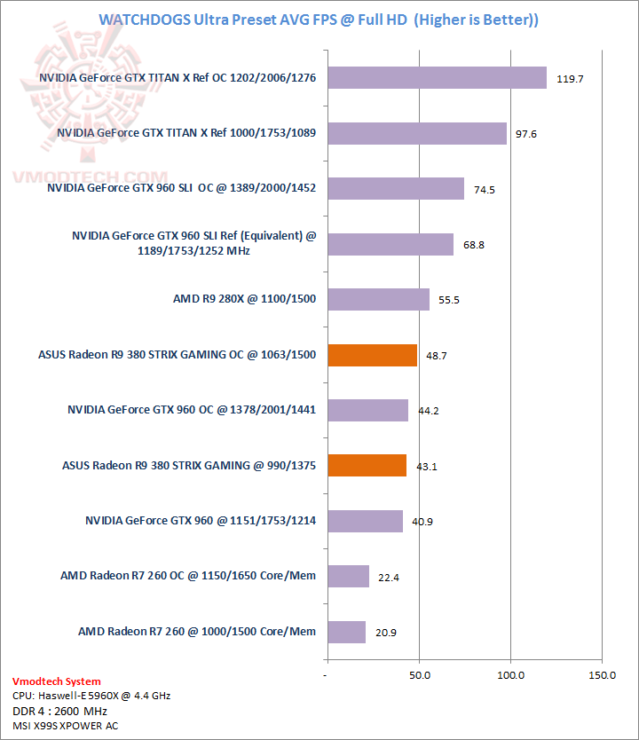 The 2 GB GDDR5 VRAM operates along a 256-bit bus and has a clock speed of 1375 MHz which gives the card total of 176 GB/s bandwidth. 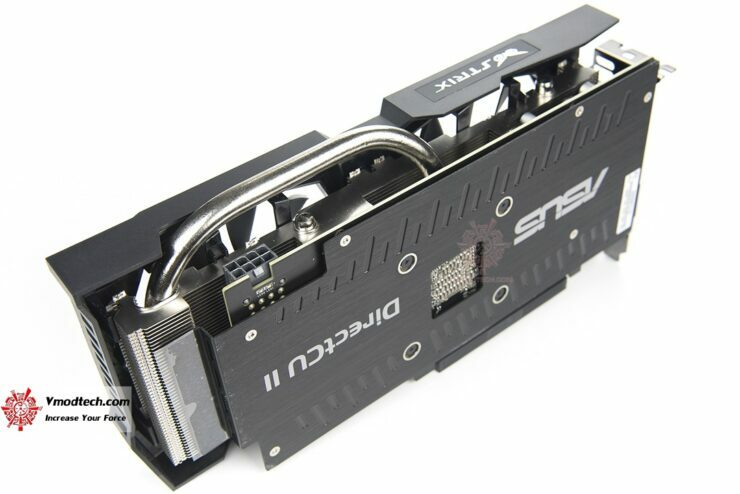 The card has a TDP of around 190W while the power is provided by a single 8 Pin connector. 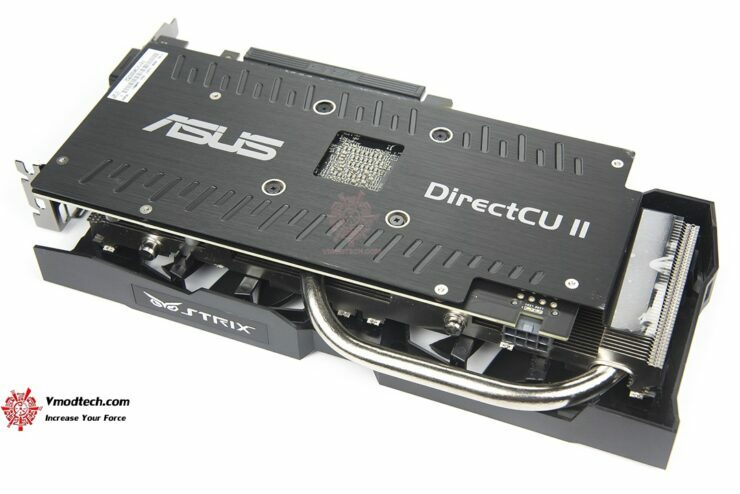 ASUS has featured their latest STRIX DirectCU II cooler on this card which incorporates triple heatpipe solution that run across a large aluminum fin array heatsink block. 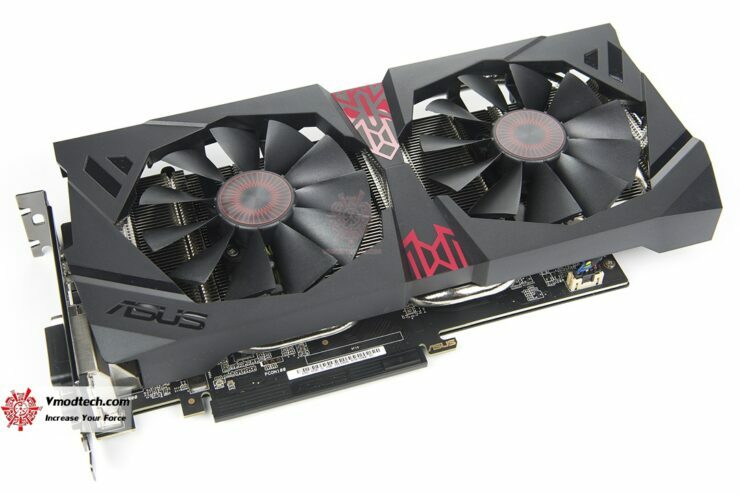 This is cooled directly by a dual PWM controlled fans while the card even has a backplate which looks really nice. Display outputs include Dual-DVI, HDMI and a single display port. 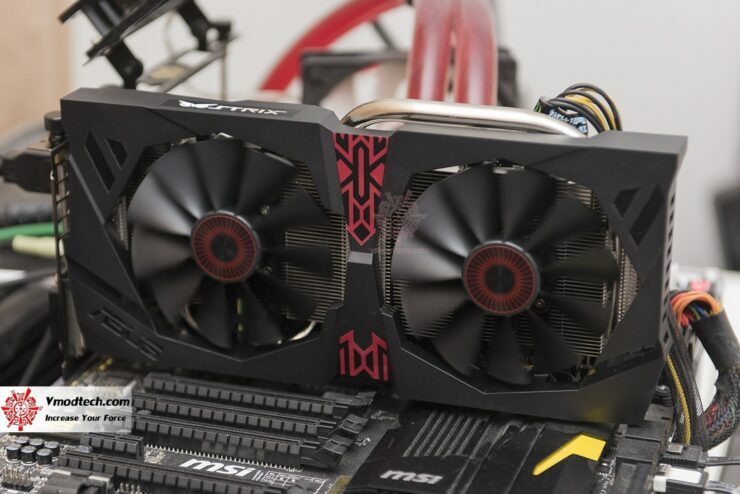 As usual, these cards adopt a dual slot design and don’t have any Crossfire connections due to XDMA crossfire technology which is also found on Radeon R9 290 series and the upcoming Fiji based Fury cards. Alright, this is boring stuff since we all know these specifications so let’s just get on with the real stuff. 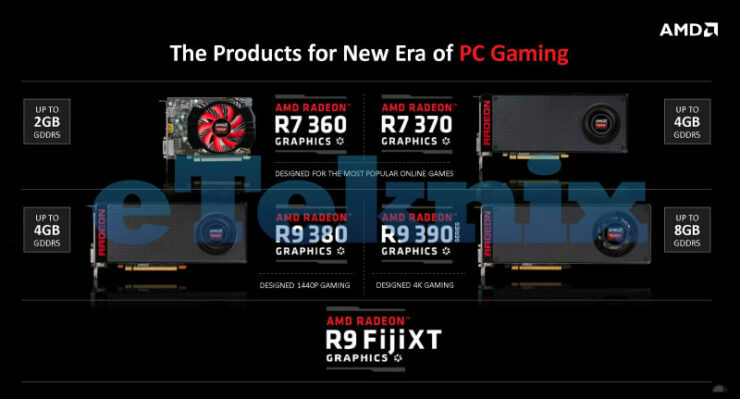 We do know the Radeon R9 380 has two variants, a 2 GB GDDR5 that is aimed at 1080P gaming and a 4 GB model that is aimed at 1440P gaming. 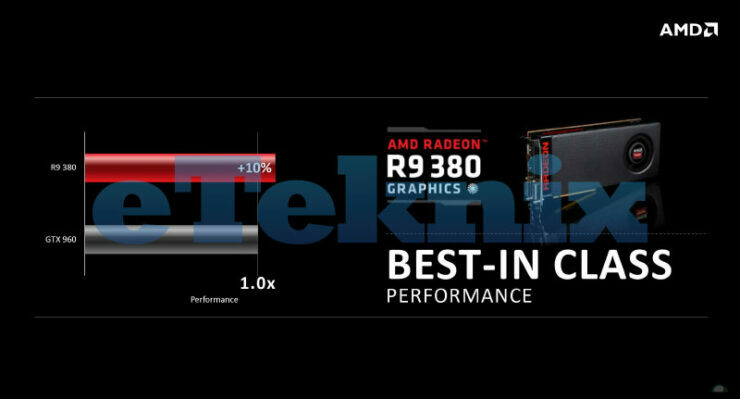 When AMD launched this card today, the specifically had the GeForce GTX 960 in mind as the direct rival to their R9 380. 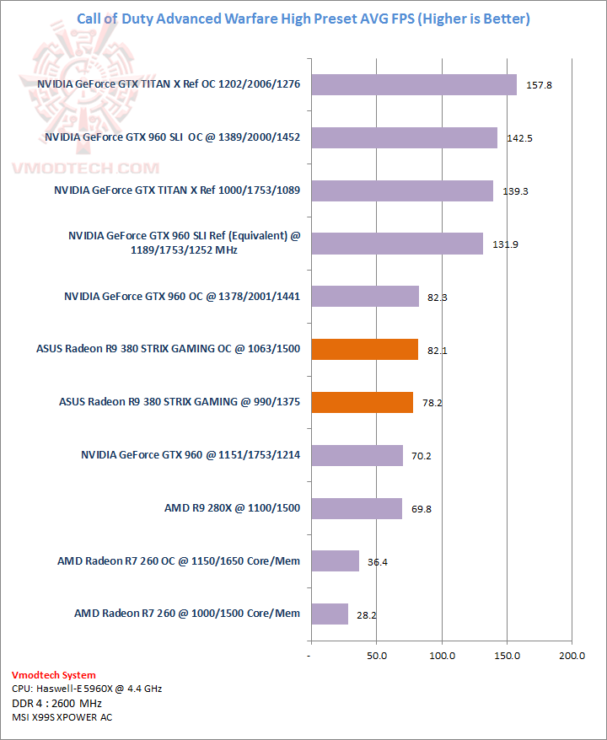 The slides prepped up by AMD showed the card as a better offering over the GeForce GTX 960 since NVIDIA’s offering is limited to a small 128-bit bus while AMD’s offering has a wider 256-bit bus interface. 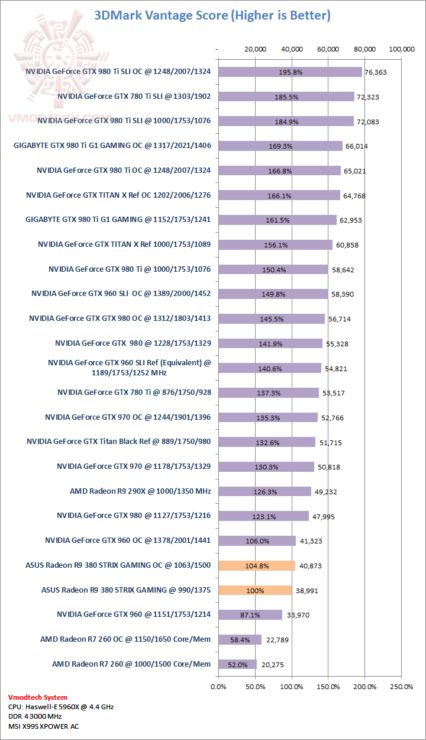 The card was said to be 10% faster than the GeForce GTX 960 but we will see how well the card actually performs against its counterpart. Do note that both Maxwell and Tonga architecture are designed with memory compression features that reduce the total bandwidth demand from a gaming title to better conserve the limited amount of bandwidth. 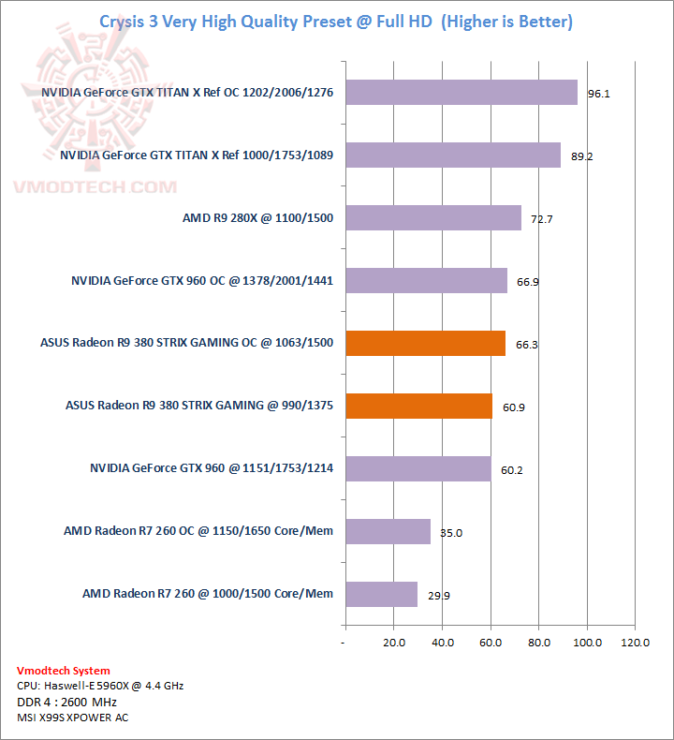 The card is indeed faster than a GeForce GTX 960 at the factory overclocked specifications but its not a vast improvement over it. 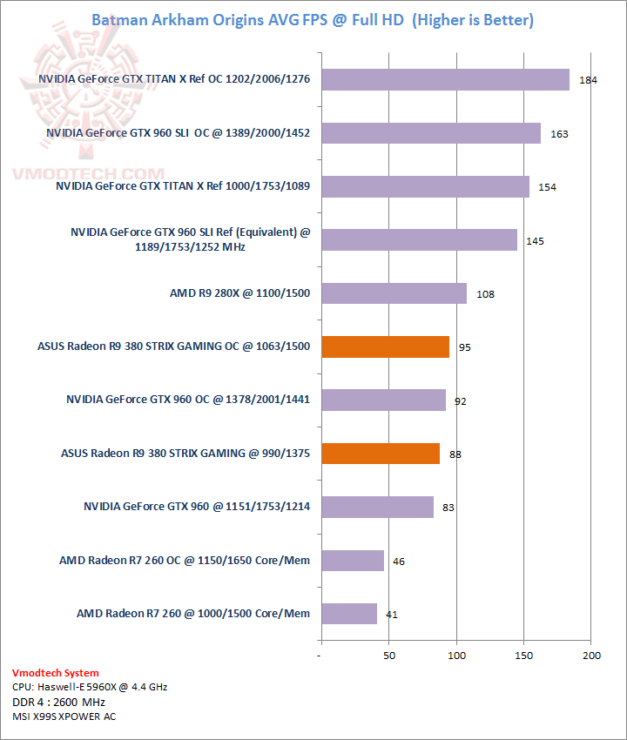 Similarly, overclocking the card leads to better performance but a GTX 960 overclocked also comes out faster than the R9 380 OC itself in several benchmarks. 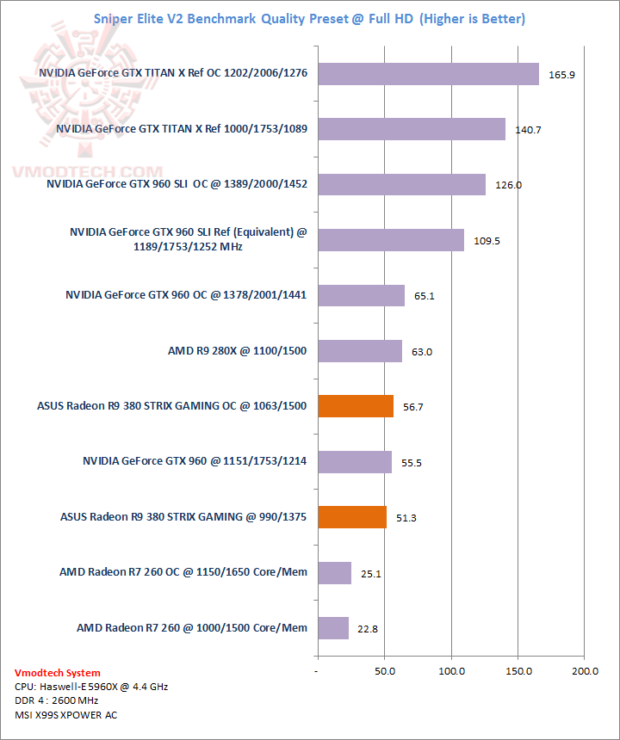 You can see the benchmarks in detail at VModtech.